As of this week, the Hearst Estate in Beverly Hills is on the market for $195 million, making it California’s priciest listing. But an analysis of property records by The Real Deal reveals that the property is weighed down by nearly $60 million in loans. Title documents related to the property, known as the Beverly House, reveal an elaborate web of LLCs and a series of intricate refinancings. The biggest loan attached to the property is a $40 million, three-year loan provided to Ross by an entity linked to Fortress Investment Group. That short-term loan matures in 2018. Another loan, provided by an entity linked to philanthropist Glorya Kaufman, has a balance of $19 million. Kaufman also serves as a guarantor on the Fortress loan, title documents show. Fortress, an investment management firm known for managing hedge funds, is widely known as an expert in distressed assets and owns special servicer CW Capital. The Fortress loan looks to be “an interim measure in the hope of obtaining better financing down the road,” said New York real estate attorney Joshua Stein, who was not involved in the deal. “You would really expect first deed of trust financing on this type of asset to be longer term and provided by a bank,” he said. Ross is now seeking to refinance the property again, and is using a nontraditional method this time. He’s tying to raise $40 million by crowdfunding, soliciting a minimum investment of $125,000 from each investor into an LLC. That entity would, in turn, make a trust deed secured loan on the property, according to StartEngine, a crowdfunding website that posted the offering. 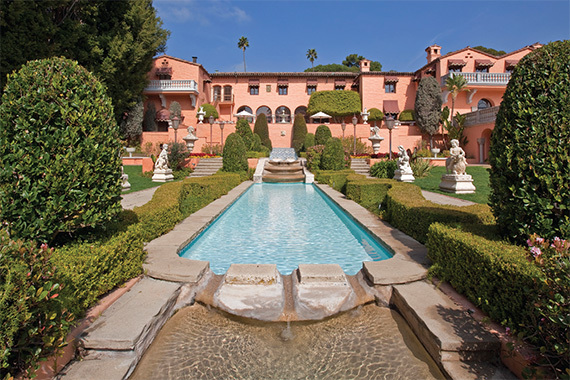 The five-acre compound, which includes the 50,000-square-foot Hearst property dating back to 1927, has 28 bedrooms and 38 bathrooms. President John F. Kennedy and Jacqueline Kennedy honeymooned there. Ross paid less than $2 million for the property about 40 years ago. In 2007, he put it on the market for $165 million, and though it was later taken off the market, sources said it’s been quietly shopped around in the years since. In 2010, Ross filed for bankruptcy protection after defaulting on a $32.5 million mortgage from Bank of America attached to the property. The bankruptcy case was later dismissed after Ross repaid his creditors successfully. But sources speculated that Ross could have difficulty securing a new loan from a traditional bank due to the bankruptcy filing. As part of the crowdfunding offering documents, it was said that Ross actually preferred to sell a 50 percent stake in the property as opposed to 100 percent.